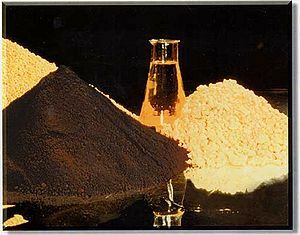 Chemical forms of uranium during conversion: yellowcake, uranyl nitrate solution [UO2(NO3)2], solid ammonium diuranate [(NH4)2U2O7], and uranium dioxide [UO2]. A chemical substance is any material having unique and defining properties, and a definite chemical composition (also known as a pure substance). Chemical substances are either chemical elements or chemical compounds. An element or molecular compound consists of only one type of atom or molecule. An ionic compound can also be a pure substance, but must contain not more than three different species of ion in a ratio expressible in single digits. Any one of these ions may be monatomic or polyatomic, however. The concept of a pure substance requires one to separate the substance from all other substances without any change to that substance. One can, for example, separate the constituent metals of an alloy without changing any one of them—but if one separates the hydrogen and oxygen in water, one obtains two new substances having properties radically different from those of the compound of which they were once part. A solid retains its own shape and volume and does not "flow." A liquid retains its own volume, but takes the shape of its container. A gas takes the size and shape of its container. A fluid is either a solid or a gas. Plasma is a special state of a very hot chemical element whose atoms are completely stripped of their electrons. Plasma is recognized as a separate state because it has properties that distinguish it even from gas. The density of any pure substance is its ratio of mass to unit volume. Closely related to density, specific gravity is a dimensionless ratio of the density of the substance to the density of a standard—typically another substance, usually a liquid, in which the substance in question is suspended. The usual standard of specific gravity is water, in which case the specific gravity is numerically equivalent to the density. But one can also define the specific gravity of a substance in, for example, an organic liquid, such as benzene. The melting point of any pure substance is the temperature at which, under common atmospheric pressure, that substance changes its state from solid to liquid. If the substance is a liquid at 25 degrees Celsius, this temperature is usually called the freezing point. Some substances, all of them compounds, will simply decompose before they ever melt. The boiling point of any pure substance is the temperature at which, under common atmospheric pressure, that substance changes its state from liquid to gas. If the substance is a gas at 25 degrees Celsius, this temperature is sometimes called the condensation point. The triple point of any pure substance is that combination of temperature and pressure at which all three phases of that substance coexist simultaneously. The specific heat of any pure substance is the amount of heat required to raise the temperature of a unit mass of that substance by one degree on a given temperature scale. The heat of fusion of any pure substance is the amount of heat required to change a unit mass of that substance, once brought to the melting point, from solid to liquid. The heat of vaporization of any pure substance is the amount of heat required to change a unit mass of that substance, once brought to the boiling point, from liquid to gas. The critical point of any pure substance is a point on a three-dimensional graph of temperature, pressure, and molar volume (ratio of volume to amount-of-substance) beyond which that substance can exist only as either a gas or a supercritical fluid. 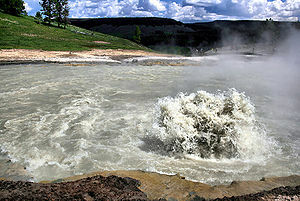 Water, for example, has a critical temperature beyond which it will exist only as dry steam at ordinary pressures. To make it liquid again, one must cool it below this critical temperature and then apply the critical pressure (the pressure coordinate of the critical point). A pure substance in the supercritical fluid state is actually the liquid and the vapor, mutually dissolved. Heating a liquid under pressure will make the meniscus (the interphase between liquid and gas) vanish. Any liquid hotter than the critical temperature, but also under the critical pressure or any higher pressure, is supercritical. If a supercritical fluid escapes into a pressure less than critical, the fluid will become a gas. But it will also expand, and expansion takes energy. With sufficient expansion a supercritical fluid might cool to a temperature below critical and then condense, especially if the energy of expansion exceeds both the heat of vaporization and the heat lost in cooling. This page was last modified on 15 April 2013, at 13:11.